This log store was designed to mirror an Oak-framed porch which it faces. The customer fitted the slate roof and it is floodlit at night as she is so proud of it. The Style S Log store is a new design, providing another option for those looking for a narrower log store. The width can be from 70cm (27.5 inches) to 190cm (76 inches) wide. The roof pitch is usually 30 degrees but we can accommodate other angles if required. The height of the store can range from 1.3m (51 inches) to 2m (79 inches) while the depth can be as shallow as 35cm (13.8 inches) or any depth up to 1m (39.4 inches). The roof overhangs 7cm (2.75 inches) to the front and each side. It also has a 5cm (2 inches) overhang to the rear to ensure efficient air circulation into the front of the store and out through the back. Efficient air circulation is highly recommended for log storage. 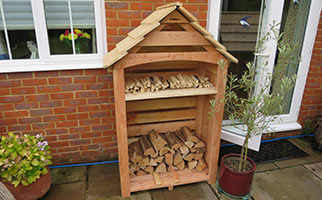 These log stores are made-to-measure and priced individually according to the size you require. All of the pictures shown on this page illustrate the first example we have built. The dimensions and price shown under each picture are given only as a guide. The prices range from £340 upwards and include VAT and delivery. These prices apply to delivery to much of the mainland UK. Delivery to remoter areas, the islands and Ireland will cost a little more and this will be included is any quotation we prepare for you. We can deliver to anywhere in the British Isles. The cost of delivery will be included in any quotation you may request. Availabilty: Lead time is currently between two and three weeks. To obtain a quotation: Select the QUOTE button below or alternatively call us on 01691 648016. Please see the diagram above for size options. We offer a made-to-measure manufacturing service, which enables you to have a log store of your chosen dimensions based upon our Style S. Each unit is despatched fully assembled, secured on a pallet. If you provide us with the measurements of the log store you would like, we will design it and give you a price and provisional delivery date. We may wish to check the sizes with you to ensure that they are practical for manufacture and use.